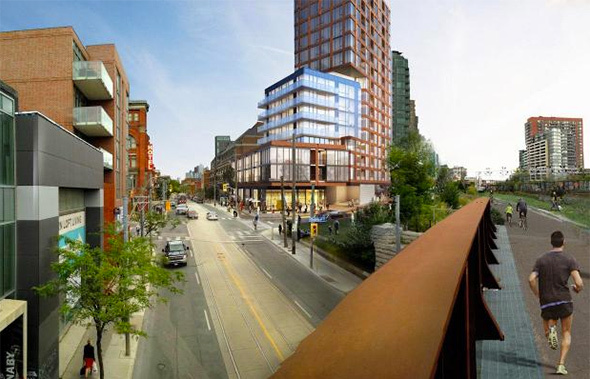 One of the most controversial Toronto condo projects is back on the table after an earlier iteration was axed by the city. 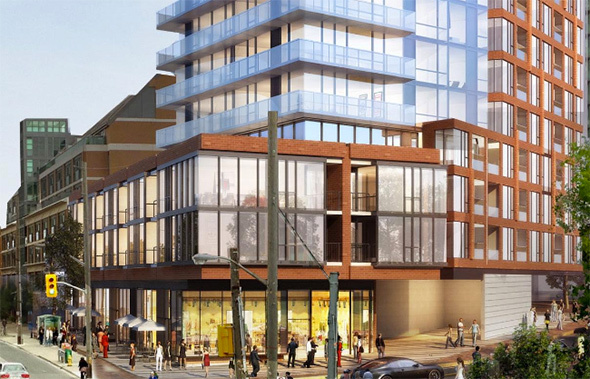 The wedge-shaped plot of land at the corner of Queen St. West and Sudbury St. has been sitting half-vacant since the Gladstone Cafe closed down, but given its prime location it was inevitable that one developer or another would make a run at revamping the site. There have been redevelopment proposals here dating back to at least 2007, when an eight-storey development was proposed to replace the dated strip plaza. Those plans were withdrawn before a 10-storey tower was dreamed up, but it too was scraped along the way. The last proposal, which dates back to 2013, called for a 26-storey tower on the site designed by Kirkor Architects. It was fraught with problems, but in fairness to the architects, the developer (YOLO Inc.) was clearly aiming way too high with their plans for the challenging space. After rejection from the city, the site went back up for sale and was eventually snagged by Skale Developments who brought on Quadrangle Architects to dream up a condo that would make it through design review. The first community meeting took place earlier this year, though only recently has the project started to get significant attention from local residents. Bohemian Embassy residents were recently asked to weigh in with their thoughts about the proposal for future public consultations. 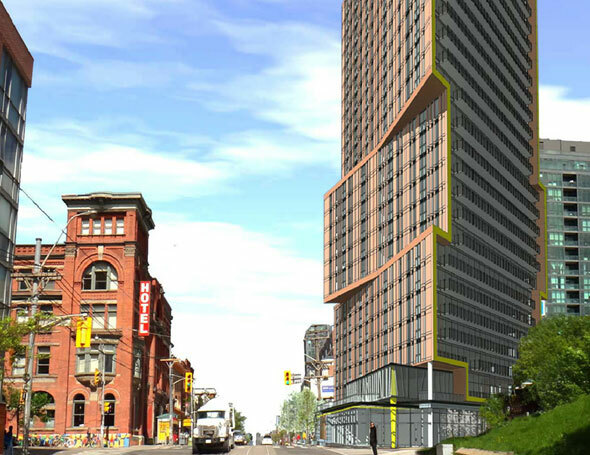 The current plans call for a 16-storey tower that's set back from Queen St. West in stages. Only three-storeys front the street, which are followed by a glass box that joins the podium to the main tower. It's not the most amazing bit of architecture we've seen in this city, but the scale suits the area well, and the impact on the street is appropriate. Given other developments of this size in the area, it should have a much better chance of making it through various design reviews. Should the project go through, it would also help to animate this corner of the street. Situated across from the Gladstone Hotel and in the heart of a major entertainment zone, the desolate existing strip plaza isn't the type of place that's going to have too many local residents screaming for preservation. What do you think of the plans? Let us know in the comments. Images via the City of Toronto.